This short sale in Golden Eagle has been reduced by another $25,000. Current asking price is $512,000, 49% below last appraisal on the property! Great short sale in Golden Eagle with waterfront views of the Golden Eagle Golf Course from your huge, custom built swimming pool! Contact us today for a private showing. Reduced by another $25,000. Current asking price is $537,000, 46% below last appraisal on the property! Great waterfront views of the Golden Eagle Golf Course from your huge, custom built swimming pool! Contact us today for a private showing of this special short sale in Golden Eagle Plantation. Reduced by another $25,000. Current asking price is $562,000, 44% below last appraisal on the property! Check out the waterfront views of the Golden Eagle Golf Course as you relax in a large, custom built swimming pool! Contact us today for a private showing, you will be glad you did! 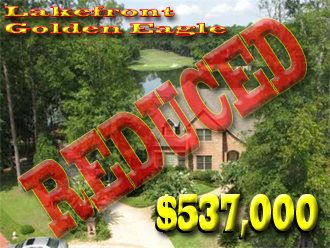 Best short sale in Golden Eagle Plantation!! Reduced by another $25,000. Current asking price is $587,000, over 40% below last appraisal on the property! Price reductions will continue on a steady pace until the property sells. Don’t miss out on the best short sale in Golden Eagle Plantation. Reduced by another $25,000. Current asking price is $612,000, nearly 40% below last appraisal on the property! Price reductions will continue on a steady pace until the property sells. Don’t miss out on the best short sale in Golden Eagle Plantation. Reduced by another $25,000. Two people viewed this short sale in Golden Eagle last weekend and two more are scheduled early this week. Price reductions will continue on a steady pace until the property sells. Don’t miss out on the best short sale in Golden Eagle Plantation. Reduced by another $25,000. Three people have scheduled to see the home this weekend. Price reductions will continue on a steady pace until the property sells. Come check out the best short sale in Golden Eagle Plantation! Every once in a while, a deal comes along that is hard to believe, and today we are going to look at a short sale in Golden Eagle Plantation that will be sold in the coming weeks (if not days). The property has dropped from a $1M appraisal to $687,000, and price reductions will come every three days (or so) until it sells. What makes this Golden Eagle short sale such a spectacular buy is that the home is situated on what is arguably the best view in all of Golden Eagle Plantation. With frontage on Lake Diane, a huge swimming pool and putting green, and a full outdoor kitchen, this one-of-a-kind home is perfect for the active family. 5 bedrooms and 5 baths ensure that everybody has room to enjoy living in a gated community in a home that has features galore. Whether you enjoy living on the lake or the fact that you have unparalleled views of 3 different holes on the Tom Fazio golf course, the whole family will be blown away with this short sale in Golden Eagle. Come check out this house while it is still available, the owners are moving in just a few short weeks. As with all short sales, the first offer in has the best chance of securing the deal with the bank. If you’ve been waiting for a great short sale in Golden Eagle Plantation, then this is the one you don’t wan’t to let slip away! Jump on this short sale in Golden Eagle Plantation before it gets away!